Obama Will Speak To Nation On Libya Monday Evening : It's All Politics President Obama will explain his Libya policy Monday following days of demands for same from lawmakers and journalists who have expressed confusion over what exactly he's trying to accomplish. President Obama, March 18, 2011. Republican and Democratic lawmakers alike, as well as journalists, have asked White House officials: why doesn't President Obama address the nation about Libya? The president has heard those calls. 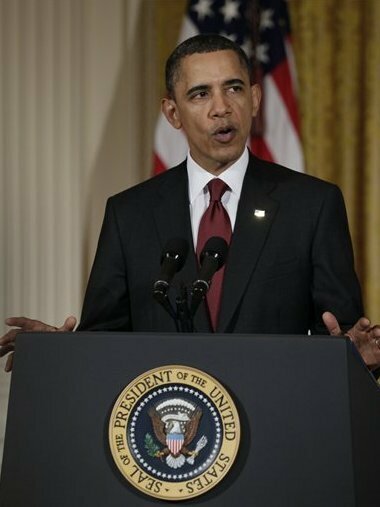 The White House said late Friday Obama will speak Monday evening. WASHINGTON—On Monday, March 28 at 7:30PM ET, the President will deliver an address at the National Defense University in Washington, DC to update the American people on the situation in Libya, including the actions we've taken with allies and partners to protect the Libyan people from the brutality of Moammar Qaddafi, the transition to NATO command and control, and our policy going forward. Lawmakers have criticized Obama for not consulting Congress enough before sending the U.S. military into action over Libya with forces from other nations to enforce a UN-sanctioned no-fly zone. Critics have questioned what exactly the goal is of U.S. participation in the international action against Moammar Gadhafi's regime. While the president has said U.S. policy is that the Libyan strongman should go, the military action's aim was to stop Gadhafi's forces from slaughtering the regime's opponents in Benghazi and elsewhere. Obama spoke with a group of lawmakers Friday to update them on the Libya operation. On March 25, President Obama briefed a bipartisan, bicameral group of Members of Congress on the situation in Libya. The President and his team provided an update on accomplishments to date, including the full transfer of enforcement of the no-fly zone to NATO, and yesterday's unanimous agreement among NATO allies to direct planning for NATO to assume command and control of the civilian protection component in accordance with UNSCR 1973. Following the briefing, the President answered multiple questions from the Members of Congress. The discussion lasted approximately one hour and took place in the White House Situation Room.